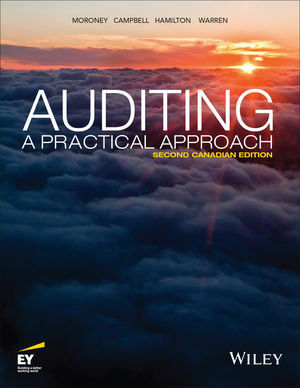 The second Canadian edition of Auditing: a Practical Approach provides a concise, practical and readable option for students studying auditing at an undergraduate and postgraduate level. The text reflects how a quality audit is conducted in practice and the issues that are of greatest concern to industry professionals. In order to communicate the key elements of the audit process a hypothetical case study, Cloud 9, underpins the audit process and methodology while providing clarity on how general audit principles are applied in practice. Acknowledging the educational trend of teaching auditing with an industry and practical focus, the text will effectively develop a student’s understanding of the various stages of an audit and how a quality audit is conducted in practice. For those wanting to cover the auditing cycle in greater depth, a new Extended Version of the text is also available with four new chapters. Current and succinct coverage. Content is fully aligned to the newly revised Canadian Auditing Standards and International Standards on Auditing. A flowchart begins each chapter providing an overview of the audit process, highlighting the stage covered in each chapter. An integrated case study based on the Ernst & Young graduate training program, Cloud 9, is integrated throughout the text, end-of-chapter application questions and WileyPLUS, our online learning and assessment environment. Students will understand how each chapter fits into the context of an audit and how these concepts are applied in practice. End-of-chapter material includes problems based on the professional accounting programs. Research-based questions require students to source standards and determine what to refer to for technical material. These techniques help students become comfortable with sourcing information and developing the skills and knowledge expected by the profession. Tools within the text, such as end of chapter problems, sampling and audit testing have been extended and are reviewed in greater detail. WileyPLUS is a research-based online environment for effective teaching and learning. WileyPLUS is packed with interactive study tools and resources–including the complete online textbook–to give your students more value for their money. With WileyPLUS, instructors can assign and automatically grade homework, practice questions, and quizzes from the end of chapter material and test bank. WileyPLUS also contains all teaching and learning resources, student and instructor supplements, and has the capability to track students’ progress in the instructor’s grade book. In addition to end of chapter questions, assignments from the Cloud 9 casebook have been integrated into the WileyPLUS course.